Church websites. Some of the first ones were fairly amateur. Hobbyists with HTML skills, making a site that could hold basic information about their local faith community. Today, the quality of church websites in Northern Ireland is very wide. Some are still showing their amateur roots. Others have been produced by particularly talented ministers and hackers – with an eye for style, together with a head full of technical knowledge about making a website that works. Finally, there are those churches which have paid someone to build them a site. They stand out a mile. In my opinion, they’re not always better than the ones produced by talented insiders. The people who make paid-for sites fall into two broad categories. Late teens, early twenties who earn a bit of money on the side producing websites. And small web companies who do it full time. I spent last night surveying a list of fifteen or so sites entered into web section of the Presbyterian Achievement in Communications Awards. I’ll link to the winner after it’s been announced at General Assembly on Thursday morning. And to protect the innocent, I’ll not link to the other entrants! I’m not someone that you’d give money to in order to generate a website. The unadventurous template that AiB uses on Blogger told you that already. But I’ve a fair idea of some of the things that make websites usable and attractive, and I’ve spent a while figuring out the kind of information that people using a church website are looking for. Call them user stories, use cases, or scenarios. But there are a few simple reasons why different groups of people go to a church website. New people to an area wanting to find out about churches in their area. They’re looking for a quick way to assess the type of church it is. Are they open to visitors? Are they engaged in their community? Is there evidence that the church is alive? Make sure that your church website can be found using a simple Google search – eg, “Church Name Presbyterian”. Visitors and new people in an area wanting to find the address – including a postcode (for the nefarious GPS) – and directions/map to the church. You’d be surprised the number of churches who have the address on one webpage, and a map on another. So you need to waste two pieces of paper printing out the details you need. And they want to quickly find the time of the Sunday services ... and don’t forget to mention if the time changes in the summer (and define what “summer” is). New families would expect to be able to find out what time and day of the week various youth organisations meet on (Girls Brigade, BB, Girl Guides, Scouts, Youth Clubs, Youth Fellowships etc). One site had a menu of pages based around day of week and then subsequent hierarchy for the organisations meeting on those days. So to find the BB details, I had to go through Monday, Tuesday, … until finding it on Friday’s page, and then click on the BB link. Very neat, but not at all intuitive. People will also want to find out who the minister is. Name, sympathetic photo and a bit about them. How can they get in touch with them. Just an email address isn’t going to be enough. If they don’t give out their home numbers, then put the church office number beside the minister’s blurb and say that you can leave a message for them on that number. If you have a church website – keep it up to date. Refresh its content regularly. It’s really disheartening to find information promoting the flower festival that finished two months ago being highlighted on the front page. Or announcements from three weeks ago, but not last week. So consider putting your weekly announcements bulletin online – if you can commit to keeping it up-to-date, and can edit out people’s personal details (addresses and possibly phone numbers too). Some churches hide these in a members area with a simple password that they print on the paper bulletins handed out to people in church. Others store them as images or Adobe FlashPaper. Keep an eye on broken links. Half the sites I looked at had broken links. Some of which I found within five clicks of surfing, others that the slightly weird but free Xenu link checker picked up in the background while I visually checked out the site’s content. And style is important - though not an end in itself. Consistency gives a website a certain feel of quality, a class if you like. Inconsistent style quickly makes the world's best content look like a dog's breakfast. So stick to the same ways of laying out pages - whether that's achieved through style sheets (CSS) or templates in your online or offline web editing tool. Think about accessibility (and mobility). Your images must have ALT tags. Does your site work with images switched off? Two thirds of the sites I looked at – including some professionally produced and paid for – had no ALT tags, or they all defaulted to “IMAGE”. Made it hard to navigate past some home pages. You should make sure you can navigate the site using a keyboard (TABbing around) and not just with a mouse. Can the legibility be enhanced by using common browser’s menu support for increasing text size? Again, I was surprised that the style sheets some professional sites used demanded absolute text sizes. Or when menu button text got larger, but the main content stayed the same size. Keep the size of your home page small. Last night’s competitors ranged from 14K up to 7MB. About a third came in around 150-200K. Another third were between 500K and 1MB. Ouch. Update - Make sure there's some way to subscribe to changes and updates on your site - eg, an RSS feed. People won't necessarily keep coming back to check your site, but they may subscribe and then see changes that way. A proportion of your site’s visitors may be using a screen reader or a non-standard browser. They may have images switched off – maybe to decrease bandwidth if they’re on the move. I’ve been frustrated more than once trying to find the address for a church using a Blackberry and finding that the page sizes exceeded the handheld device’s buffer or required several minutes of frantic GPRS traffic to download the page. PCI also has Guidelines for Internet Usage which it encourages congregations to adopt. The principles around use of photos - individuals, young people, permissions - copyright, external links etc. That’s not a definitive list – but it covers some of the important bases. I’d be interested to hear read your suggestions, so please do leave comments below. Playing music on your homepage is a neat trick, but think twice, thrice and then pray about it for a month before actually doing it. Animated icons are tiresome. As are links to pages that just say “Under Construction”. Nearly better to have no link that a fruitless one. While no church based their entire site around Wordpress (expect to see that next year), some did use it niftily embedded within their sites for news items and blogs. About a third of the sites offered downloads of services/sermons. One even offered live streaming as an extension of the more traditional “tape ministry” (that now features CDs rather than worn out C90s cassettes). Offering downloads which include hymns and songs may be in breach of copyright if the correct licences are not arranged. Without wanting to wind up a previous anonymous commenter, the long-running tea bag saga has just got sillier. Shopping in Secret Sainsburys on Monday threw up a new twist in the quest to find out why are two small boxes cheaper than double sized box of tea? There's a new promotion on at the moment. And Sainsburys have knocked 50p off the price of both the 80 bag and the 160 bag boxes of Teadirect, further accentuating the already weird pricing. Reducing the 80 bag boxes to 92p and the 160 bag boxes to £3.35. So a big box is double the size and more than three and a half times as expensive. (Sainsburys haven't replied to the email sent to their Customer Services yet, though when chased they did acknowledge that they were working on a reply.) Update - 3 June - they replied. Give me an H, give me an O ... N ... D ... A. What does it spell? Honda! Millions of years after it was created, and the world still throws up firsts every day. As well as the 350,000+ unique children born today, Honda screened a live three minute advert at 8:10pm on Channel 4 tonight. If like me you missed it, but are curious about the level of success of the team of stunt parachutists in the sky above Spain in spelling out the word Honda before opening their chutes, and wondering how well the technology held together, then it's available to watch again on the Honda website. Update - it's now up on Youtube. Part two of a look at Ofcom’s Nations & Regions Communication’s Market Report for Northern Ireland that was launched this time last week. So what does the Almanac have to say about radio? Norn Iron likes its radio. The quarterly RAJAR figures quoted by Ofcom show that BBC Radio Ulster/Foyle remains dominant – partly at the expense of the BBC national radio channels (except Radio 1) – with a stonking 25% of the local share of listening hours compared to much lower tallies for regional BBC services in England (10%), Scotland (9%) and Wales (15%). Our share of listening to available local commercial stations is 31%, roughly in line with the UK average, a bit higher than Wales (27%) but lower than Scotland (43%). But at 7% share, local listening to national commercial stations (like Classic FM, talkSport etc) is low: at least four percentage points lower than the rest of the UK. Unsurprising given the lack of variety of stations to listen to. Perhaps the most differentiating stat about Northern Ireland’s share of listening hours is the 10% allocated to Ofcom’s Other category – a basket which includes RTE Radio as well as community radio and short term licensed stations. That’s eight percentage points higher than the UK average. (RTE are shortly to ditch MW broadcasts.) RTE listening figures for Northern Ireland are scarce - I can't find any - and the UK quarterly RAJAR survey only covers UK-based radio stations. But the community stations are contributing some of the listening in the 10% too. A total of fourteen community licences have now been awarded in NI - seven are already on air. Per head of population, this is more than double any other region of the UK, and serves to further highlight NI’s love of local – local news, local gossip, local radio. But what about digital? AiB’s all about the widgets, gizmos, and things that don’t last long but do look shiny. Northern Ireland’s two DAB multiplexes (local commercial + BBC national stations) cover approximately 87% of the population. The UK-wide commercial multiplex - Digital One - doesn’t cover Northern Ireland: apparently not enough available digital spectrum to squeeze it in! But with only a poxy 20 stations available to listen to, your jaw will hardly hit the ground when you realise that the local ownership of DAB radio sets has only risen from 11% to 13% over the last year, compared to a four percentage point growth across the UK (now up to 22%). At the moment, DAB’s limited audience reach wouldn’t pay for new stations like U105 to rent a slot on the local commercial multiplex. Though back in 2000, RTE did (unsuccessfully) apply for slots on the local commercial multiplex. And even the raw awareness of DAB lags behind. Just over half (54%) of those surveyed in NI have heard the term “DAB digital radio” compared to 75% across the UK. (Can’t find any mention of awareness in previous year’s reports to compare back to.) But perhaps part of the long term answer is some kind of reorganisation of the multiplex structure - like Ofcom are proposing for Freeview to squeeze HD into the same spectrum. It's all in the hands of the recently formed digital radio group to come up with a way forward for the digital radio industry, and more importantly, the listeners. 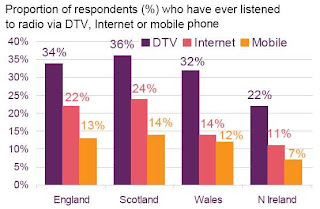 Widening out from DAB to listening to the radio by any digital means (Freeview/Satellite, Internet or a Mobile phone), Northern Ireland is still the Luddite region of the UK. In Northern Ireland, you’re three times as likely to live in a household where someone has watched TV or video online than one in which someone has listened to the radio online! Online radio listening doesn’t seem to be affected by broadband penetration (the thin green line), pointing to the fact that radio was, and still is, usable over dialup connection speeds or GPRS. Doctor Who skipped a week to make way for Eurovision. In the meantime, Mr and Mrs Dalek’s relationship is suffering, work pressures, screaming kids and Mr Dalek’s dark secret aren't helping matters. Mi spulling's are not alwaies purrfect. Now on an informal blog, the odd mistake can be easily overlooked. But when it comes to printing posters and signage, particularly in a university, it's really important to get it right, first time, every time. Could it be the new office of the film buffs? When you walk in the door, is there a constant supply of frantic piano music in the background? 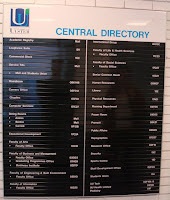 And this shouldn't be taken as a swipe at the University of Ulster at Jordanstown ... every institution has its fair share of bloopers in the dictionary department. I seem to remember a couple of mistakes in a notice put up in some lifts I frequently use - and one of the mistakes remains in the "corrected" signs. 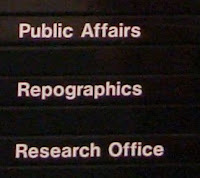 But misspelling Reprographics must be close to unforgivable! 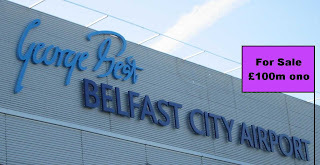 As mentioned back at the beginning of April, Belfast City Airport has now formally been put up for sale by owners Ferrovial. Having bought BAA, Ferrovial are now keen to recoup some cash (BHD price tag estimated at £100m) to lessen their estimated €30bn debt continuing their trend of disposing of some more Australian, European and UK assets. Still no word on the anticipated runway extension - which could affect the sale price. 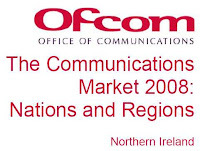 Ofcom's Nations & Regions Communication's Market Report - what does it say about Northern Ireland? 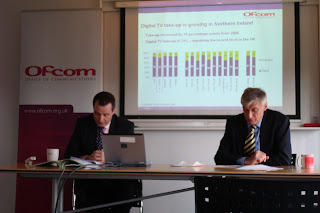 The launch of Ofcom’s Nations & Regions Communication’s Market Report has become an annual event. AiB mentioned it back in 2006. It’s basically the results of a huge survey carried out across the UK (backed up by figures from various Ofcom stakeholders – telcos and broadcasters etc) looking at television, radio, telecoms and (new for this year) a section on converged communications. It’s kind of the Wisden Cricketers’ Almanac for media and comms anoraks. For their 2008 report, nearly six thousand people were interviewed across the UK in January and February, with 629 surveyed in Northern Ireland. The analysis is published in four parts – England, Scotland, Wales and Northern Ireland. The NI report was launched by Ofcom NI in their shiny white and friendly offices in Belfast’s Gasworks on Thursday morning. That’s Denis Wolinski (Director of Ofcom NI) on the right, the only one in the room with a Manchester United mug – he was pleased with the previous night’s result in Moscow! Now Northern Ireland might be small, but it’s not uniform in its tastes and can be sliced and diced in so many ways. 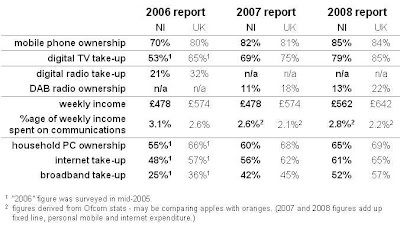 So for the first time there wasn’t just a rural/urban comparison for the NI stats. From this year it includes figures for east/west of the Bann (both further divided into urban/rural). And then there are specific figures for Londonderry/Derry and Belfast as well as Small towns (Enniskillen, Omagh, Newry, Dungannon, Armagh, Ballycastle, Cookstown, Coleraine) and Border areas (Derry, Newry, Strabane, Portstewart, Warrenpoint). Forgive me for thinking Newry was a small city rather than a small town! On average, people in Northern Ireland watch less TV than the rest of the UK. And our viewing of the main five terrestrial TV channels is “not haemorrhaging like the rest of the UK regions”. We’re the Luddites of digital radio with the lowest awareness of DAB, lowest ownership of DAB radios, and the lowest number of people who’ve ever listened to radio by any digital means (DAB, cable, Freeview, online, etc). With highest speeds and DSL availability in urban areas, broadband take-up is actually strongest in rural areas. And if you have broadband, use of wireless hubs is particularly popular in Northern Ireland with particular peaks in the rural east and border areas. Though Swansea, Yorkshire, Newcastle upon Tyne and the rural east/south east of England can top that. Inadvertent mobile roaming across the border is still a problem, and very few people affected are aware of the new tariffs that O2 and 3 have introduced to address the issue. If you live in Belfast you’re twice as likely to know about the new tariffs than someone living in a border region. 3G covers only 44% of NI – yet take-up of 3G handsets equals the rest of the UK (with an average of 90% 3G coverage). Northern Ireland has a higher than average use of mobile phones to listen to audio content (such as radio, MP3s or podcasts). Derry is particularly high, though behind the audiophiles in Liverpool and Birmingham. I’d never heard of the term media stacking before seeing the report. Basically, using two or more different types of media at the same time. Like rubbing your tummy and patting your head. Perhaps, watching TV and talking on a mobile or surfing the internet. And the Ofcom random stat of the year ... as of January 2008 there were over 6,000 Wikipedia articles in Irish and over 2,000 in Ulster Scots. Trivial Pursuit, here we come. Two years ago it felt like Northern Ireland was on the wrong side of the digital divide. But the 2008 figures offer some hope. I’ve update the quick summary table from the blog post two years ago to give some kind of rough comparison. We still lag behind, but not by as much. See later more detailed posts covering radio, TV, mobile & fixed telecoms, broadband and online. While Habitat may be building affordable housing in faith and hope, their supporters were putting their faith in ropemakers as well as the builders and (post-bomb) renovators of Belfast’s Europa hotel as they abseiled down the side of it on Saturday morning. My wife is either very brave or very foolish. 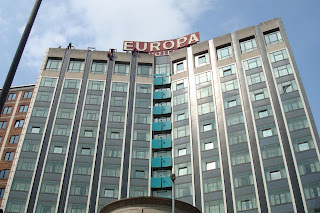 Certainly you wouldn’t find me stepping backwards off the top of the Europa hotel for a gentle stroll (backwards) down the side of the building. 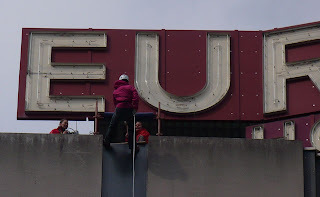 That’s her up between the E and the U of the big sign. Not everyone was enjoying such a solid start. But after a bit of rescuing and restarting, everyone made it on a rope down to the bottom and through the patio door back into the hotel to safety and the comfort of floors. We ended up waiting about an hour on the other side of the road just up from the Crown waiting for Cheryl to appear. Littl’un seemed completely unperturbed by the fact that Mummy was dangling off the top of a building. But then, I suppose I’d decided there was no point getting at all worried either. The organisers had four ropes going simultaneously, with people at various stages of descent. Time to appraise the different styles of descent. Some – including Cheryl’s colleague Katrina – were prepared to turn around a wave to the crowds gathered on the far side of the street, and in the window to amused guests. One man – no doubt despite specific instruction to the contrary – bounced his way down. He obviously knew what he was doing. The lolloping motion reminded me of pictures of Apollo astronauts doing their moonwalks. Graceful bouncing. Though it meant he was down in half a minute – a quarter of most other peoples’ descent. So rather her than me. And if the Gift Aid supplement is added to the raw donations, she’s raised two thirds of the price of a Habitat house in the developing world – that’s £800 against a target of £1,235. So thanks to all of you who donated, and sent good wishes. 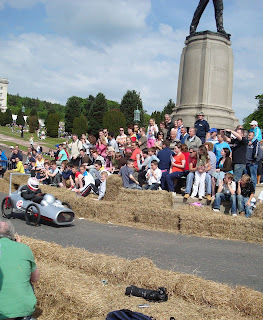 There was a family atmosphere up at Stormont estate this afternoon as people enjoyed the sunshine and soaked in the thrills and spills of the Red Bull-sponsored soapbox cars hurtling down the twisty course laid out on the main Stormont driveway. 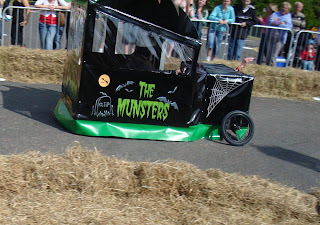 The grey car pictured immediately below from Ruddell Metals in Hillsborough was the eventual winner - with a cracking time down the course. Big screens and a live commentary kept the crowds informed of what had gone wrong at every turn ... though this one did go on the blink near the end of the afternoon. Not everyone made it all the way to the bottom of the course ... and there were a few tense moments as the condition of crashed drivers was checked before showing the much-anticipated action replay of the crash. 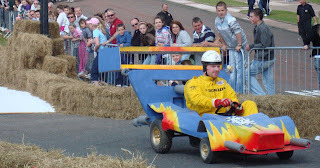 While some of the cars might have had serious engineering behind them - though all were gravity powered - no engines allowed - some had obviously skimped on the brakes and invested in roll cages instead. 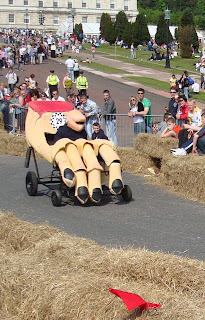 The final ramp - which served as the finish line as well as a method of breaking braking the cars - sorted the sheep from the goats. Very few cars, managed to come to a halt without something falling off. A great event to have up at Stormont, well stewarded, good weather, and the shuttle buses were busy. And even if the traffic wardens were working overtime ticketing cars that had parked in-between the police cones near the Stormont gates, at least they had the sense not to ticket everyone parked on the Belmont Road pavement near the Old Holywood Road and Massey Avenue. Update - Check out teedee's great slideshow on Flickr and his photographs of the afternoon's racing. The Swedish entry managed a bizarre monochrome start to the song. Weird. Did the Eurovision vetting squad know that the French entry would feature Helium? The Latvian pirate entry could be popular. Spain managed to combine Bollywood with a touch of the toy instrument. Our sofa's favourite was the Danish entry that looked like they could sing and were enjoying themselves. And the red button "subtitles and extra sarcasm" service was perfect. While the UK entry was competent, I can't see it doing well. In fact, I can't see any of the four guaranteed-to-be-in-the-final nations doing well. Most countries will have already seen and heard 10 of the entries at their semi-final, and familiarity must give them a head start. Whereas the French, German, Spanish and UK entries are relative unknowns. Update - voting over - And it turned into a two horse race between Greece and Russia, with Armenia sitting like the Lib Dems in third place. And in the end Russia ran skated away with the prize of hosting next year's final. During the scoring, Terry called the 12 points from Iceland to Denmark perfectly. Did I pick up the vibe from Terry that he's not sure if he'll be back to commentate next year? (I wasn't the only one.) Who would they replace him with? With Ken Bruce wedded to the Radio 2 coverage, would Jonathon Ross be the leading candidate? Andy Abraham's song will become a footnote in Eurovision history, occupying the UK's now annual position near at the bottom of the voting table. I wonder whether they should volunteer to waive their automatic place in the final and work their way through the semi-finals? Looking out the window of Stormont's Long Gallery last Monday night, we could see a colourful arch across the main avenue. But by the time we emerged (after the Barry and Basil show) it had gone. 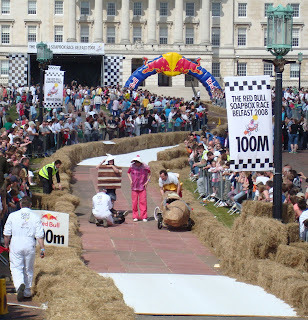 Now it looks like it was in preparation for Sunday's Soapbox racing organised by Red Bull - basically cars powered by gravity that will hurtle down the windy track (with hay bales at each side) until they reach the bottom. About 44 teams have been busy building their light-weight vehicles and will be competing between 1pm and 5pm tomorrow - Sunday 24 May. To help with parking, a Park and Ride scheme will be in operation from Dundonald High School and Holywood Exchange - £5 to park and a free bus up to the Stormont gates at Massey Avenue. Starting at 11am, there will also be a fleet of ten buses running from Chichester Street out to the front gates of Stormont on the Newtownards Road - £1.50 per person. Time to tie up a few loose ends. There was good news when we got back from a long weekend in Gloucester and wandered around to Lindsay cars. They had a second key (and the original first). So I actually got to drive the car back home instead of walking! Turns out that second keys for Ford cars don't have the remote locking buttons. They're just straight key barrels. Bit of a surprise. But one I can live with. 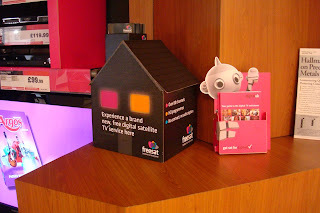 Second surprise was discovering a box of Freesat promotional leaflets in the Ross's Court Argos in the centre of Belfast. No set top boxes on display, but at least a couple of the models are now in stock and available to purchase. Two subjects I hope AiB won't be returning to in a hurry. 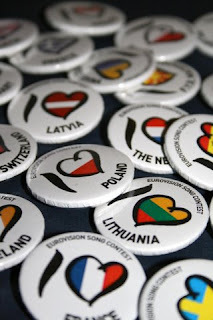 Update: And for completeness I should mention the countries that were successful in the second semifinal on Thursday night: Iceland, Sweden, Turkey, Ukraine, Albania, Latvia, Croatia, Denmark, Georgia and Portugal. From Sunday morning - after the contest is over (and forgotten) - the full results will be revealed, so we can find out just how badly Dustin the turkey did in the voting! 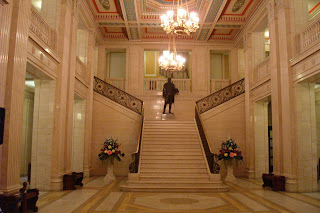 It's not often you get to walk up the steps in front of Stormont (technically Parliament Buildings) and go in through the main doors. In fact, after the Stone-got-caught-in-the-door incident, you no longer get to go up the steps at the front at all. Instead, you're routed through a perspex security hut - looks a bit like a car wash - to the bottom right hand side of the building, which processes all visitors, conveys their belongings through a "airport" scanner, and allows you out the far side if you're deemed to be clean. After Monday night's reception in the Long Gallery, the two hosting MLAs volunteered to take folk down to the main Assembly Chamber. And so the Barry and Basil show began. While coming from quite different political backgrounds, Barry McElduff (Sinn Fein) and Basil McCrea (UUP) are among the more frequent speakers and contributors to the local assembly. Maybe it's their shared dislike for the DUP, but the pair of them made very relaxed, humorous and interesting tour guides, outlining the history (and rebuilding) of the chamber, pointing out some of the features and explaining a few secrets. So look out for Barry McElduff pinching a mint from speaker William Hay's stash as he comes in from voting in the left-hand no lobby. It was encouraging to see politicians enthusiastically explaining their role and the building they occupy. And good to see a bit of proper cooperation between sometimes political foes. 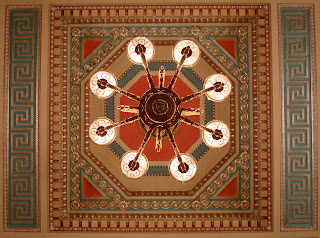 In January 1995 a fire, caused by an electrical fault, completely destroyed the Chamber and the opportunity was taken, not only to restore the Chamber to its original grandeur, but to upgrade the entire building. In order to ensure the burr walnut walls could be replaced in the Chamber, all the English walnut available at the time of restoration was purchased in advance. 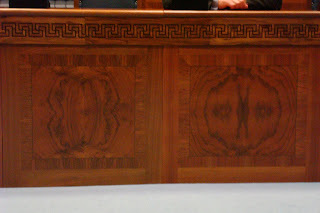 Like the originals, the new walnut wall panels are inlaid with an intricate, hand carved, ebony, Greek key pattern. If you ever get a chance to pop up to Stormont, particularly as part of a tour group, do take the opportunity to find out how it all works. One word of caution: there are a lot of "No photography" signs around ... though not always anyone to police them! You'd struggle to get me to agree to do it, but then my wife is braver than me. Or is that more foolish? 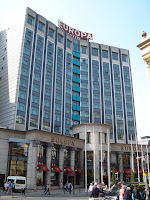 Cheryl Wonders is abseiling down the front of the Europa Hotel in Belfast this Saturday morning. Along with students from UUJ, she's raising money for Habitat for Humanity. Spending a day recently building on their Belfast site, they didn't get any higher up than the roof space. 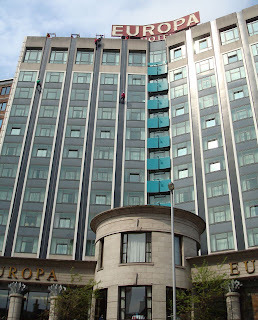 But on Saturday it'll be a tad higher as they step off the top of what was once the most bombed hotel in Europe ... and probably the most abseiled now! "Instead of burning each other out, Habitat is getting communities to work together on building homes for those who need them. £1250 is what it costs on average for Habitat for Humanity to build a new home in the developing world. When I agreed to do this abseiling lark, the challenge was for us to raise 125 each, so that ten people had paid for a house... But since I'm going to be 40 ... sometime in the next ten years... (ahem) I thought perhaps together we could pay for a whole house. What do you say?" We *are* part of The Big Word Project! Not sure if it's a bid to pay off student loans, but a couple of enterprising students have come up with a wheeze that will surely make their bank managers smile all the way to the swimming pool showroom. 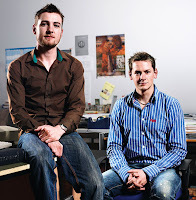 Paddy and Lee graduated with 1st Class Honours in Interactive Multimedia Design, 2007. In an effort to be eternal students, they now studying Masters in Multi-Disciplinary Design at the University of Ulster, Belfast. In the spirit of trying it out, I wanted a small word. After all, these local entrepreneurs profiting $1 per letter from the bought up words. Belfast isn't (yet) in their dictionary, and in is already taken. But wasn't. So, there we . I'm happy so say that we part of The Big Word Project. Not quite sure why. But there we go. £1.58 well spent? There’s something very reassuring about a burger and chips. 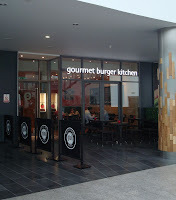 It’s the reason that airports, railway stations and sporting venues have burger outlets. A lot of people enjoy munching a bit of beef between two pieces of bread, and eating salty chips. 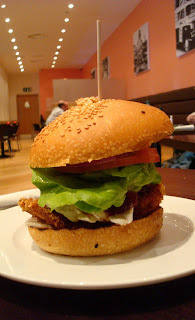 A year or so ago, I ended up eating in a lot of different “gourmet” outlets in central London – Ultimate Burger, Gourmet Burger Kitchen and Burger Shack. While the main Victoria Square complex opened in March, a lot of the food outlets remained closed until last week. 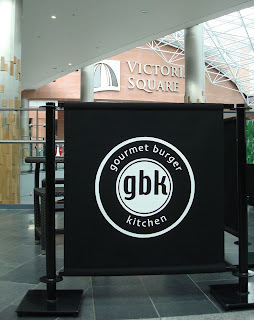 We nipped into the new Gourmet Burger Kitchen branch (GBK – the English chain – not the local GBB). It’s a bit strange. Practically empty restaurant. Waiter comes over, takes a drinks order and then gets us to walk across to the cash till to order burgers, sides and pay up. Efficient, not. The décor is smart but basic. There’s a picture of George Best that makes it feel very local. But then there’s a picture of an old Evening Standard van that makes it a lot less Belfast. The food was excellent. My Chicken Camembert & Cranberry burger with fries was wonderful. Typing this brings back the taste into my mouth. The salty, thick cut chips. The cranberry mixing with the melted cheese. Umm. Heavenly. Overall it’s a bit very expensive for lunch – might be good for a team lunch, but not for a quick bite to eat. Charging £1.60 to add a piece of bacon into a Cheese burger seemed excessive. But terribly, terribly tasty if you’ve the spare cash or want a treat.